dejiolaluweblog: Opinion: What distant observers can’t seem to wrap their heads around with Lagos politics? 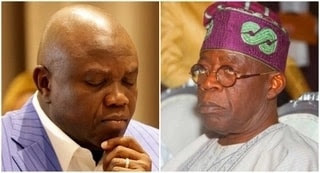 Opinion: What distant observers can’t seem to wrap their heads around with Lagos politics? Nigeria is in the thick of election preparations. And candidates across the various political parties have jostled to emerge as flag bearers for many of the available elective offices. Needless to say the entire process hasn’t been without one shenanigans or the other. But overall, arguably, success stories can be said to be more than stalemates or failures. With less than two weeks or so to the elections proper, it’s interesting to know that a couple of the states are still enmeshed in one crisis or the other particularly that of disputed primaries conducted by virtually all the parties to choose their respective candidates. Some candidates as we speak are still in the court slugging it out. In state like Zamfara for instance, the ruling All Progressive Congress (APC), will not be fielding any governorship candidate on the backdrop of a primary which according to the electoral umpire was conducted in violation of laid down rules and regulations. Similarly in Rivers, the party has not been able to successfully navigate the bitterly contested governorship primary. And unless the pending case in the court is brought to a satisfactory close, it may not field any governorship candidate in the state. In Ogun and Imo states on the other hand, the outgoing governors are still disgruntled and sorely bitter and complaining after their respective anointed candidates lost out in the primaries. The Ogun state governor, Ibikunle Amosun is reported to be determined not to support the party’s governorship candidate while being inclined to working for the re-election bid of the incumbent president, Muhammadu Buhari in an election he’s also a senatorial candidate of the party. Clearly, what you’ve there is a case of a divided house. It’s, however, remains to be seen if it would stand. Only the days ahead can tell. But the signs are not too positive. In Imo, the outgoing governor, Rochas Okorocha is not only disgruntled over what transpired during the governorship primary, he has been predicting doom for the party in the state in the coming elections. Lagos state it must be noted equally had a near political mines experience in the process of conducting its governorship primary. The governor, Akinwunmi Ambode, who before then appears to be coasting home to victory unchallenged in his re-election bid for being widely acclaimed for his many urban renewal projects that cut across the length and breadth of the state. During the same period, political stakeholders from outside the state, and from within the state in particular have been endorsing him in drove on the strength of his perceptible to the eyes performance. Under his watch, Lagos has become a huge construction site. And like I said earlier, his political chances seem cast in stone favorably. But in a sudden twist, his political fortunes appear to have been hit by an unforeseen reactionary political tsunami. In a space of days, the ensuing meltdown seamlessly took away all his hard earn and much deceptive political capital. And he was left alone and in the cold with no temporary succor of any kind. What went wrong? How did the shout of Hosanna change overnight to tumultuous cry of crucify him? This sad turn of event, no doubt, took many by surprise; and cause many a distant observers to wag their tongues about what they considered an injustice. But I for one wasn’t taken by stealth for the reason of his dismantling of the all-inclusive, effective waste management legacy of the Raji Fashola’s administration. Lagos before you say jack, has suddenly become unpardonably dirty and it was down to his dodgy environmental policy or the lack of one. And secondly was his blind pursuit of vendetta against his predecessors and his many landmark achievements. The political establishment in Lagos had also listed out some of his political sins for which he was being led to the guillotine to include his untrammelled individualism and gross disrespect for some of its chiefs. He was equally accused of shutting all the channels of positive engagements to them; and this they opined impacted negatively on the grass root politicking. Obviously, his re-election ambition presented a perfect occasion to pay him back. And he got a full dose of the same medicine he had administered on them overtime. Everywhere he turned at that crunchy hour, he met tightly shut doors of angry foot soldiers he had disdained before then but who could’ve been instrumental to his re-election chances. So all this while, he has been living in fool’s paradise and didn’t know it regrettably. To cut the story short, it was the former Lagos State Commissioner for environment, Babajide Sanwo-olu instead who emerged as the All Progressive Congress (APC) governorship flag bearer. And interestingly left to mourn with Ambode were the out of perspective distant observers. As they struggle to wrap their heads around the dynamics of the unfolding political event and by extension of Lagos politics, many had and still resorted to name calling in their pardonable ignorance. They amongst others stoop so low as to call Lagos a Tinubu’s ‘colony’. This is reminiscent only of the paid mouthpiece of the opposition party back then, AIT, which had in a manner of slavish hireling aired a defamatory documentary which portrayed the APC’s national leader, Asiwaju Bola Tinubu, as lion of Bourdilon accusing him of many unverifiable political wrong doings until they were put in their place by the court. It’s long been in public domain they had to settle out of court, tendered an unreserved apology to the man, when it was glaring they have no sufficient evidence to defend their frivolous claims in the court when he slammed them with a multi billion Naira lawsuit. They ate the humble pie. The governor, theses clueless outside elements and their insiders’ co-travellers faulted for choosing to dine with the devil with a short spoon and so they felt no pity for him. Tinubu cannot be the devil; and neither can he be a saint like any of us. I’m so surprise that even people who’re not so sure of their own righteousness can cast the first stone. It’s a pity! Some even erroneously believe Lagos is a no man’s land. We all perfectly know where that treacherous assertion is coming from. But Lagos certainly cannot be a no man’s land. It was, is and will forever be a part and parcel of Yoruba home land. It’s an historical fact and nothing can change it..
Lagos in spite of the ignorance of this motley crowd of wailers cannot be a Tinubu’s colony alone. It’s a home for all. It’s a state which ticks all the relevant boxes when it comes to development indices. If I may ask, how can Lagos which boasts arguably the largest gathering of intellectuals in the country, the largest presence of media establishments- prints and broadcast and bloggers, largest community of business outfits and population be a Tinubu’s colony? No doubt its residents have unrestricted access to information upon which to base their judgment politically and otherwise. They, therefore, cannot be Zombies without opinions; without a voice. To characterize them so low is an insulting slap on the faces of the thinking men and women of Lagos, regardless where they are from, who by their deliberate hard and smart efforts had built one of the most robust societies in terms of everything developmental and growing in the world. Lagos today is the much envied political-economic melting point of Nigeria, and one which the opposition has overtime been secretly eyeing to no avail. Do I need to remind us again of desperate efforts made by presidents Obasanjo and Goodluck. The former seized its money, after it created thirty seven council areas with Tinubu as governor. The matter went to court and Lagos floored the federal government up to the Supreme Court. But he Obasanjo neither obeyed the Court judgment nor pay monies due to Lagos. Mischievous elements argued he didn’t obey the court ruling then lest he’s seen as helping his own people to come up to par with Kano, a state with similar population yet more local council areas. After all, government is about the people and not land mass. But even if he didn’t recognize the council areas created what about withholding its statutory monthly allocations for years only for his successor, late president Yar’adua to pay the same money shortly after being sworn in. Isn’t that punitive! Yet the same man goes about these days accusing others of acting in tyrannical ways. And people give ears to his inconsistent ramblings like a man suffering verbal diarrhea. Tinubu as a leader and bridge builder per excellence is only a product of combination of hard work and providence. His ascension to political prominence is not by accident. He’s not the lord of manor like a few had estimated him overtime. People made him, and he respond accordingly to them in the most visionary, strategic and dynamic manner typified only after the one and only Yoruba sage and philosophical king, Chief Obafemi Awolowo of blessed memory. Above all, he’s got the character, capacity and competence to occupy his eminent position. He’s in every sense quintessential a politician, and nobody can dress him down on the altar of cheap political jealousy or envy. Labels: Opinion, What distant observers can’t seem to wrap their heads around with Lagos politics?